One would think that Colorado resorts would be the preferred location for corporate retreats. Certainly enough corporate retreats have occurred at Lake Tahoe, Utah, Montana, and Colorado ski resorts. However, recently a retreat for a group of maritime attorneys from Texas was organized for Snowshoe in West Virginia. More than two dozen maritime lawyers from the Texas and Mississippi attended. All meetings and seminars with topics that related to the Jones Act and Admiralty law, the repercussions of the Deepwater Horizon oil spill, among other topics were held in the morning to allow the maritime lawyers and their families to enjoy out door activities in the afternoons. Aside from skiing, there were lots of fun activities available including off-road tours, snowmobile tours, the Coca-Cola Tube Park for youngsters, snowcat tours, and the indoor Big Top, a 15,000 square foot playground with many inflatable options, wii, tots area, a climbing wall, Eurobungy,and snack bar for both children and adults. Since Snowshoe is home to 251 acres of skiable terrain, 1500 vertical feet, 57 trails and the best snow around, everyone had plenty of room to explore. For skiers they offer three ski areas that include the Snowshoe Basin, Western Territory and Silver Creek. Some evenings were for socializing or networking. The feedback was everyone thought the retreat was a huge success and expected even more maritime attorneys to attend the next year. The Mid Atlantic and Southeast ski resorts have a lot to offer. Don’t count them out! Jack Frost – small and can seem more crowded than it really is. All-in-all nothing too special but okay for shorter stays. Blue Mountain – good Eastern mountain with surprisingly varied terrain for all levels (nice vertical, run length and trees), some crowding but decent cost. Day trips during less busy times will give a serious skier reasonable satisfaction. Solid night skiing and terrain park. 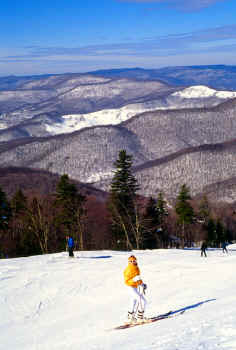 Blue Knob – longer runs than many PA resorts, with good terrain and reasonable lines depending on your timing. Seven Springs – decent hill for beginners and boarders, with some attraction for blue families. Creeping toward expensive, but still a nice choice for shorter stays. Elk Mountain – nice vertical and good snow for the Poconos. Relatively remote, without much in the way of variety, but more than enough for a day of solid skiing. Hidden Valley – clean and friendly place to get your kids from green to blue, but otherwise not much to offer serious skiers on or off the slopes. Snowshoe – aspires to be world-class (for better or worse). ‘Upside-down’ mountaintop village is artificial but cute, and the snow and trails are simply the best in this part of the country. Busy and expensive, but still worthwhile for skiers and boarders alike (if you can endure ‘Aspen-East’ crowds!) . Timberline – good alternative to Snowshoe trendiness. Solid trails and snow at reasonable prices, but can get crowded and not much nightlife. Canaan Valley – decent old-school resort with some nice trails and beautiful scenery. Good one for all-around Family vacations. Mountain Creek – NYC getaway with all the pros and cons you’d expect. Icy, expensive and generally full of inconsiderate people, but the hill is pretty good for boarders, with some decent trails to be found. Not recommended for families, or anyone else with a better option. Sugar Mountain – popular resort with some nice terrain but depends greatly upon the weather. High costs, long lines, and generally frustrating facilities can sour you quickly even on the best days. Ski Beech Mountain – may be preferable to Sugar; shorter lines and somewhat friendlier overall. Still only recommended for shorter, less-demanding trips. Appalachian – friendlier still, but very small and really suitable only for short-run beginners and boarders (decent terrain parks!). Wintergreen – typical mid-Atlantic resort; small, often icy, and can be busy and costly but bargain-hunting green-blue families with good timing may have a wonderful experience. WISP – surprisingly solid DC-area ski resort with good options for the greens and blues. Most attractive for families and the expense is not bad, but powder turns to ice quickly on busier weekends. Good place to learn before heading north and/or west for the real thing. Ober Gatlinburg – best in the state, though hard to recommend for a long-distance ski trip. Short, crowded, and often icy trails with very little to offer serious skiers. Still, beginners and families on vacation may enjoy the skiing as part of many local activities.